Get every inch of your body toned, fit and ready for the beach with this HIIT Bikini Body Circuit. A 30-minute high-intensity workout to blast fat, sculpt your body and tone your muscles from head to toe! 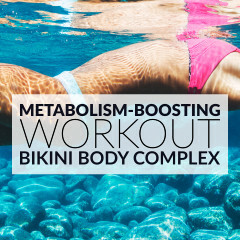 Start this full body bikini circuit with a 10 minute warm up routine. 1. Jump rope: 60 seconds. Keep your knees slightly bent and jump with both feet at the same time, one foot at a time, or alternate between feet. 2. Medicine ball push up: 45 seconds. Start in a push up position with your legs extended back, the hands below the shoulders and a medicine ball under your left hand. Start bending your elbows and lower your chest until it’s just above the floor. Return to the starting position, roll the ball to your right side and repeat. 3. Cross jacks: 60 seconds. Stand with your feet shoulder-width apart, your arms up and extended out to the sides, and jump up, while crossing your legs and arms in front of you. 4. Wall crunches: 45 seconds. Lie on your back and with your legs up the wall. Lift your shoulders off the mat, squeeze the abs, and hold for 1 to 2 seconds. 5. Jump start: 30 seconds + 30 seconds. Stand on your left leg, bend your knee, extend your right leg back, and touch your left foot with your right hand. Jump quickly, drive your right knee up and land softly on your left foot. Repeat for 30 seconds and switch sides. 6. Sprinter crunch: 45 seconds. Lie on your back with your legs fully extended and your arms bent and by your sides. Lift your torso off the floor, bend your right leg and bring your right knee close to your left elbow. Repeat on the opposite side. 7. Breakdancer kick: 60 seconds. Get on your hands and knees and lift your knees a few inches off the floor. Lift your left hand and your right foot, rotate your hips to the left, place your left heel on the floor, and kick your right leg to the left. Return to the starting position and repeat on the opposite side. 8. Tricep dips: 45 seconds. Place your hands behind you onto a bench, extend your legs and start bending your elbows. Lower yourself until your arms are at a 90-degree angle and then come back up. 9. Basketball shots: 30 seconds + 30 seconds. Bend your knees, press your hips back, and take both hands close to your right foot. Jump up and extend your arms above your head and to the left. Repeat for 30 seconds and then switch sides. 10. Plank leg lifts: 60 seconds. Start in a low plank position with your body in a straight line, your elbows bent and under your shoulders, and your feet hip width apart. Lift your left leg to a 45-degree angle and hold for 2 seconds. Switch legs and repeat. Stretch your whole body and relax with this 5 minute stretching routine. Get every inch of your body toned & fit with this Bikini Body HIIT Circuit!